IXS Japan has announced a 4 legged walking robot which is developed in co-operation with Kondo science. Named ‘BJ’ it is almost the same size as the Sony Aibo and with the production of Aibo discontinued BJ looks to be a suitable contender. It has 3 joints for each leg (12 in all), 2 for neck, 1 for jaw and 16 for tail. It is powered by an i.MX Core 11 CPU, 64MB RAM and 16MB Flash ROM. BJ has a 350,000 pixel CMOS sensor (30 fps), 1 x Distance sensor, 1 x Acceleration sensor and 4 x Metal sphere sensors. As for interface BJ can communicate using Ethernet slot, Memory stick Slot, 2 x USB ports and 3 x Serial ports. The unit runs on Linux and comes with iQRs03 Communicator a software using which you can program BJ to perform activities like walking, running etc. 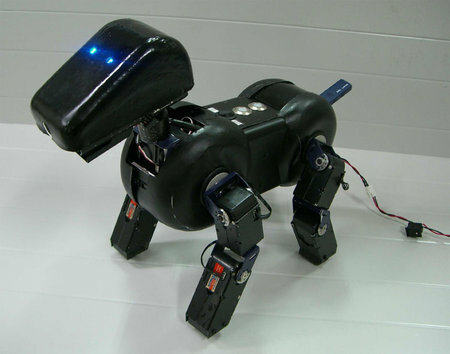 BJ measures 180×350×312mm and weighs 2.5kg it will be available by 2007 fall worldwide for 600,000 Yen ($ 4850) a bit too expensive than the Aibo.